The vaqueros of the Americas were the outstanding horsemen and cattle herders of Spanish Mexico. You may also hear the term buckaroo used, as well. The spade bit is a curb bit, has a narrow port with a high spoon-like piece affixed to it. The bit is usually decorated. 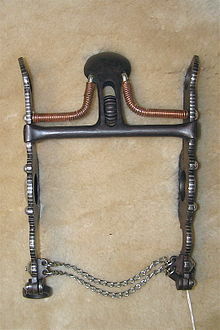 As you can see from the image the bit is supported by braces on either side. It has shanks as well. This particular bit was designed by the vaqueros. If used incorrectly it could be extremely harsh for the horse. However, the vaqueros were highly skilled in its use. The highly skilled vaqueros considered the use of this bit to be the highest form of communication and trust between horse and rider. Not all horses were candidates for the use of this bit just as not all riders were able to use this bit properly. 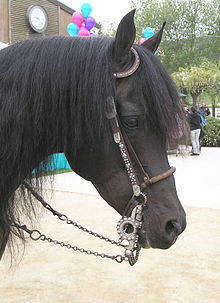 For example, a horse had to have a conformation that included a high neck set and well carried head. The horse's temperament had to be such that a full partnership between horse and rider could be achieved. It should also be noted that in order to finish a horse for the use of a spade bit the time frame of training under saddle often took up to 5-7 years. At the end of that process it was poetry between horse and rider! Finished "straight-up spade bit" with California-style bosalito and bridle.